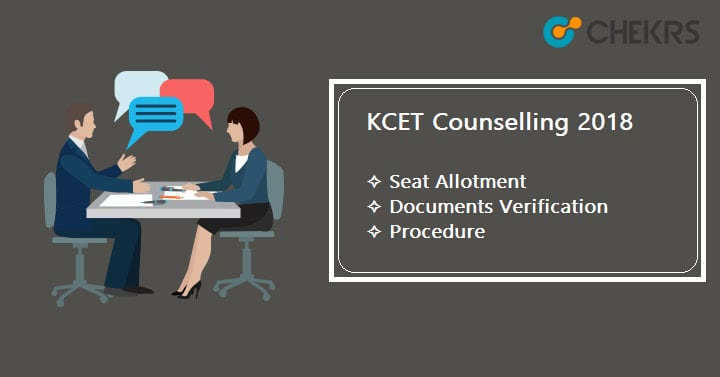 KCET Counselling 2018: The KCET counselling will be conducted by Karnataka Examination Authority from the 2nd week of June. The Karnataka Common Entrance Test (KCET) is a state level entrance exam which helps to get the admission in the field of Architecture, Engineering, and pharmacy. After qualifying, the exam and counselling candidates can get the admission in the colleges of the Karnataka. The KCET exam was in the month of the April. We are providing here the KCET Counselling Dates in the table given below. The counselling is expected to be start in the month of June. When the counseling of KCET is held, candidates have to bring the original documents along with the photos for verification. Candidates have to report at the counseling center for the verification and registration as per the scheduled given to him. A link is generated on the website for the candidate to check the list of Nodal centers and addresses. After the authentication of the document, an authentication slip will be delivered to the candidate, after which he/she can participate in preference entry round. A unique user ID and password is given to the candidate after completion of the verification process. SSLC/ 10th standard mark sheet. Original copy of the challan as evidence of fee payment. After the document verification is done, candidates have to choose the colleges and the courses. If candidates choose the college through the online mode, then they have to log in by their CET number. The admission authority will choose the candidate through the course wise, category wise and college wise seat matrix and the link are shared by the candidates. In order of the favor, candidates have to select the courses and colleges as per the eligibility. The option enter by the candidate in the first round will remain same for all the remaining rounds. After the final submission, there will no change will be made from the candidate side. The last and the final step in the counseling process is the allotment seats. The seats are allotted to candidate according to their ranking and selection of colleges and courses during counseling. Candidates have to download their seat allotment/admission letter by signing through their credentials. After Seat allotment candidates have to report at the allotted institute. Candidate’s documents will be verified there. and after successful verification, Candidate will get admission in their respective course.